KINGSTON, N.Y. – Kingston Stockade FC has named Jamal Lis-Simmons, a Highland native who has served as the team’s captain since its inception, as the club’s new Head Coach. Lis-Simmons becomes the club’s head coach after three standout seasons as a defender and captain for the team, earning a spot on the All-NPSL First Team in 2017, and Third Team honors in 2016. He is the third head coach in club history, following David Lindholm, who held the post for the last two seasons, and Hall-of-Fame coach George Vizvary, who served in the club’s inaugural season in 2016. Assuming head coaching responsibilities immediately, Lis-Simmons will name the rest of his coaching staff in the coming months, and will start the process of building the roster for 2019 with the assistance of Technical Director Dan Hoffay. “Jamal brings an extremely professional, winning attitude to Stockade FC,” said Hoffay. “He has been part of all our ups and downs, and he knows first-hand what it takes to win in this league. I am excited to work closely with Jamal to continue building a championship atmosphere within our program.” The head coach of the SUNY Ulster Men’s Soccer program since 2016, Lis-Simmons served as an assistant coach at SUNY New Paltz under Hall of Fame coach Gene Ventriglia from 2012-2015. He was also the head coach at Highland High School from 2004-06, leading the team to a 40-14-1 record and coaching current Stockade FC Technical Director Dan Hoffay, who also now serves as his assistant coach at Ulster. As a player, Lis-Simmons enjoyed a decorated career prior to the creation of Kingston Stockade FC. He began playing collegiate soccer at the University of Albany in 2000-01, being nominated for conference rookie of the year in 2001, and later finished at SUNY New Paltz, where he earned Second Team All-SUNYAC and Team MVP honors in 2011. He was also given the Athletic Department Leadership Award in 2011. He was a three-time participant in the Empire Games (2004-2006), earning two medals. Lis-Simmons was a four year starter at Highland High School, earning All-League and All-Second honors in each season, as well as three consecutive league titles and a Section 9 championship. He graduated from SUNY New Paltz in 2015 with a B.A. in history and currently works in the Student Support Services department at SUNY Ulster. He now lives in Highland with his wife, Stephanie, and daughter, Soleil Jade. 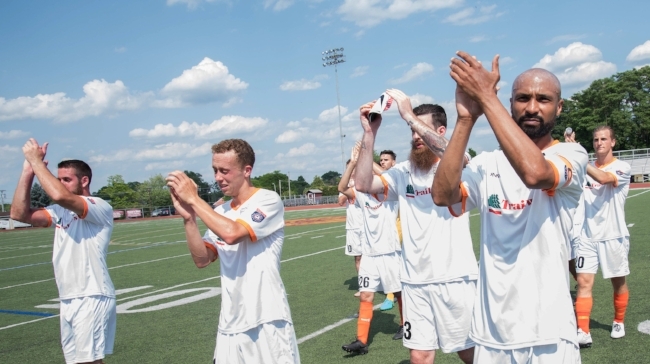 Kingston Stockade FC competes in the semi-professional National Premier Soccer League (NPSL), the fourth division of American soccer, and has achieved unprecedented success in just three full seasons, winning a conference championship in 2017 and competing in the U.S. Open Cup in 2018. The club is committed to helping improve and develop lower-division soccer in the United States, through an open-source and accessible approach.